Writing a memo can seem to be a bit daunting at first, but it isn't difficult if you know the steps. As with any business document, it's important to properly format and organize any memo you are writing, as well as to ensure that it's error free before distribution. 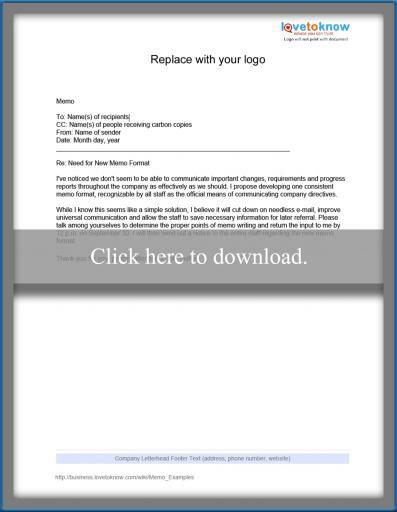 Business memos that will be printed or emailed as attachments should begin with a heading that lists the name(s) of the staff members who will be receiving it. If the memo will be included in the body of an email, this section is not necessary because the email program will provide the information typically included in a memo heading for you. CC: names of people who will be copied on the email. Headings should include the full name (no nicknames) of the person or people who will receive the document. You should also include your full name, and the date the memo was prepared. The next part of the heading is the subject of the memo, which is usually indicated by "RE:", which stands for "regarding." Make the subject as specific as possible. Instead of a general heading such as "New Policy," choose "New Policy for Scheduling Vacations." If the menu will be copied to other people, end the heading with a CC: line. Introduction: This should be a short paragraph of two or three sentences that lets people know the reason for the memo in a direct manner. Recommendations or purpose: This section gets to the meat of the message using key points, highlights or background information. It may include supporting detail like facts and statistics, as well as examples and reasons for the memo. Conclusion: The conclusion will make it clear what action needs to be taken and when it needs to be completed or reiterates the timely news included in the memo. Proof the memo carefully before you send it. Make sure that is free from typos and that the document accurately conveys the point(s) you want to get across. Use the following guidelines when evaluating what you have written and make changes as needed. Audience-appropriate: Verify the document is appropriate for the education, background, company status and needs of the recipients. Concise: Remove needless words and keep the memo to one page or less in most circumstances. Coherent: Make sure that the memo structure is simple and logical and that each paragraph is limited to one idea. Readability: Make sure to keep paragraphs short and use bullet points to list key details. Terminology: Use appropriate terminology that the audience can be expected to understand. Factual tone: Verify that the tone is professional and that you have not included emotionally-charged words. Appearance: Ensure the finished document is visually appealing and easy to read. When you are sure the memo is ready to go, hand-write your initials by your name on the 'from' line, then copy and distribute the document to the recipient(s) if you are sending hard copies. While you can apply the tips above to setting up and formatting a memo yourself, you may also find it helpful to start from a blank template. If you'd like to do this, simply click the image below and a customizable template that you can edit, save and print will open in a separate window. If you need help downloading the template, check out these helpful tips. Once the template is open, click anywhere in the document to replace the text with the details of your memo, being sure to follow the tips outlined above. When you are finished, use the menu commands to save and print. Of course, there are many different reasons you may need to write a memo, and deciding what to say can be challenging. Review these memo examples if you'd like to see additional examples of pre-written memos for inspiration.